Butternut and Blue co-owner, Jim McLean, is currently collecting material on three projects. He hopes to begin writing the history of the 14th Brooklyn sometime in late 2009. The Berdan Sharpshooter project, a projected multi-volume history, would follow. 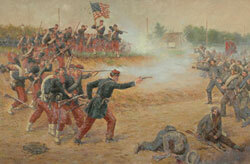 The revision of Cutler's Brigade could expand into a detailed study of the July 1st morning fight at Gettysburg. Anyone willing to share letters, diaries, memoirs, and/or photographs on these regiments should contact us. We are willing to pay copying and shipping costs. Proper credit in the books will be noted once the projects are complete.